San Andres is located to the northeast of Colombia's Caribbean coast. San Andres has beautiful beaches characterized by white sand, red corals and transparent water that has seven different shades of blue -- for this reason it is known as the "Sea of Seven Colors." 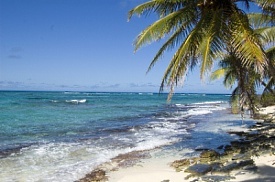 The waters around San Andres are perfect for snorkeling and good diving is plentiful.